It’s a blustery Friday afternoon, but that hasn’t stopped 150 pupils from schools across Manchester braving the elements to meet their favourite author, Alex Scarrow, at the People’s History Museum. Alex has also brought along copies of his thrilling time-travel adventure series, TimeRiders, in which three teenagers have cheated death and are recruited by a secret time travel agency with one purpose: to fix broken time. We listen intently as Alex reads an extract from his first book in the series, bringing the characters to life with his impressive array of dramatic voices and igniting all of our imaginations. 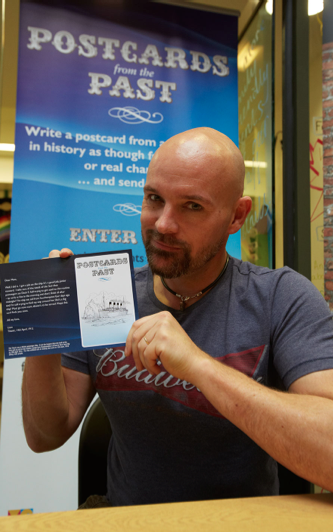 In keeping with the time-travel theme, Alex is also here to help us launch a brand new writing competition called ‘Postcards from the Past,’ which asks entrants to pick a year from history or research a key event, then write a postcard from the point of view of a real or fictional character. Winners of the competition will receive 100 copies of their very own, professionally illustrated and designed, postcard. To give you an example of what a potential entry might look like, Alex, together with a host of other authors, has put together a sample version. To see Alex’s entry click here. What’s different about this competition is that it’s open to everyone, aged 8 to 80! Reflecting on his own past, Alex tells us that he previously worked as a computer games designer, every boy’s dream job, but found the commercial aspects of the industry fettered his creativity and ultimately came to the conclusion that writing was the only way he could truly bring his outlandish ideas to life. He’s not surprised that the majority of the children are familiar with the games he’s worked on, but he is a little taken aback to learn that just as many have read his books. It seems, in the battle to capture children’s imaginations, Alex’ crazy concepts are giving X-Box and PlayStation a run for their money! Holly Ashurst, from St George’s Primary School, tells us she “loved Alex’s impressions”, while fellow pupil, Oruwa Isibor, feels “inspired to go and write a book”. Navigating my way through a sea of pupils, all waiting eagerly to have their books and postcards signed, I finally get the opportunity to steal a second or two with Alex to capture his thoughts on today’s event: “I have really enjoyed meeting the pupils this afternoon. They have inspired me with their enthusiasm for reading and writing. This just goes to show how important it is for children to meet authors, and literary festivals like this are a perfect opportunity to do just that.” There’s no doubt that the pupils here share his sentiments, as they scuttle away, in search of exhibits around the People’s History Museum to draw inspiration from. 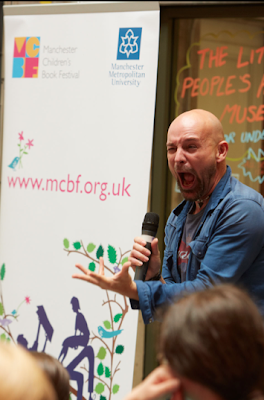 The 2012 book festival was a huge success and MCBF are delighted to be able to continue working with the Manchester Literature Festival to provide children with exciting author events and writing competitions. To receive details of other schools events and projects, email hlssschools@mmu.ac.uk and we’ll add you to our mailing list. The full information for Postcards from the past is on www.mcln.org.uk (including sample postcards, posters and the entry form).